MASKerade: Cutting Edge #5 - Happy Birthday! Cutting Edge #5 - Happy Birthday! All around blog land yesterday, I kept coming across this amazing inspiration for The Cutting Edge #5 by Melania Deasy. I haven't played along with this new challenge yet - sometimes it's so hard to keep up with everything you want to do, right? But this card is just so pretty, and it's such a great idea to use a negative die cut with a positive die cut laid over top. I knew my time had come! I chose a Papertrey "Happy" (negative die cut) and a Simon Says Stamp "birthday" (coloured, positive die cut) and added a few mini-sequins. Beautiful take on the inspiration card Ardyth. Love how you interpreted this in classic Ardyth fashion with a gorgeous spectrum of colors. Very bold and nicely put together. Just gorgeous! Love the rainbow colors. Fabulous birthday card, Ardyth. And, could that possibly be a rectangle? I always enjoy your cards Ardyth. 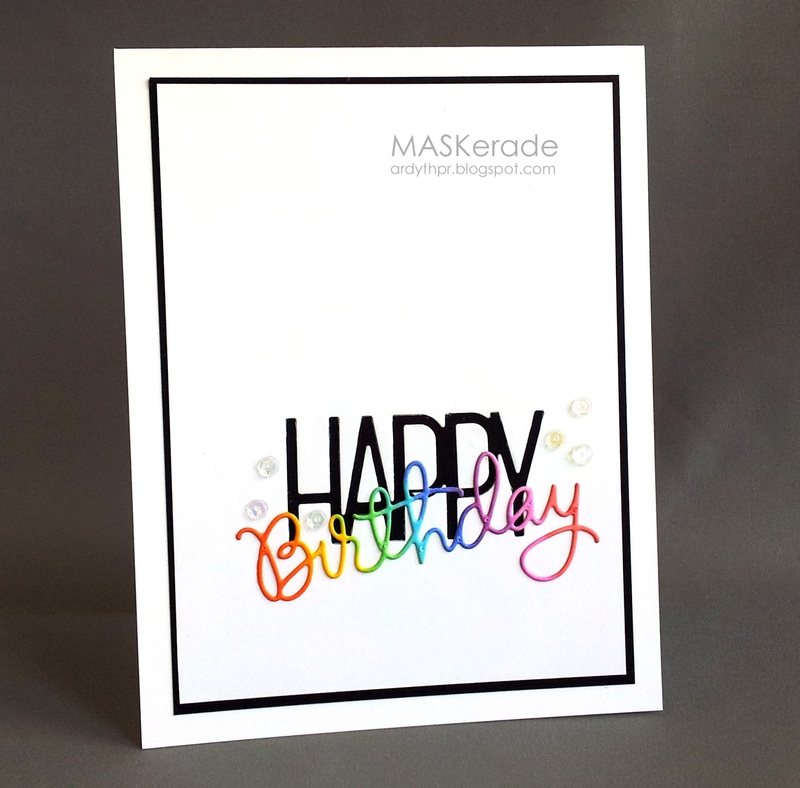 This one is very COOL, the multicolored "birthday" really stands out. Thanks so much for playing along with us at The Cutting Edge Challenge!!! Your the perfect rainbow maker!! And those colours really pop against the black. Genius card yet again! Great card - I love the jazzy feel! This is beautiful, love the rainbow birthday! soooo pretty, your rainbow birthday! Oh, Ardyth, your cards are always wonderful!! LOVE the black with rainbow...my favorite combo, for sure...CAS perfection:)!! So happy you joined the challenge this week:)!! !